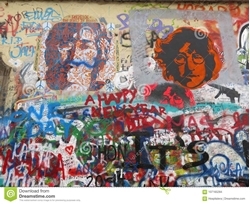 Artists decorate Prague's Lennon Wall with pictures of "love and peace" . Beatles Radio: The Beatles, Solos, Covers, Birthdays, News The Fab 4 and More! Artists decorate Prague's Lennon Wall with pictures of "love and peace"
About two dozens of Czech and foreign artists Monday decorated with the famous Lennon Wall in Prague, capital of the Czech Republic, with new pictures and inscriptions of "love and peace". The wall, which is the outer side of the park garden opposite the French Embassy building, was a memorial to singer-songwriter John Lennon. Since the 1980s, it has been filled with John Lennon-inspired graffiti and pieces of lyrics from Beatles' songs. In the past years, it has become one of the most popular tourist attractions in Prague and was seen as a symbol of global ideas such as "love and peace". The artwork, namely "Meet Art", was co-created by artists from the Czech Republic and those from Slovakia, Serbia, Canada and Sultanate of Oman. Some tourists also contributed their talents. They painted the entire wall with one of the motifs of "All you need is love", title of the Lennon's famous song. The action aims to return the previous role to the Wall and make passers-by to write their own poems on the wall instead of dirty words and vulgar pictures, said the organizers.